I am Wendy Spinks and I am the Team lead, responsible for making the magic happen in a collective of imagineers, creators, artists and writers living in Cape Town, South Africa, guided by our intuition and a deep love for animated storytelling and serving humanity through our unique creative expression. Zeropoint, because it's the field of pure potential at the heart of creation. And 528 because, well, 528Hz is known as the 'miracle' tone or love frequency. We are connected through a deep desire to create quality original content that opens hearts through storytelling and spreads awareness about themes and issues we care about to impact real change in the world. Join the journey into the zero point field as we collaborate as a collective and cooperative to bring to life various animated transmedia projects for series, short films and VR (Virtual Reality). Each of our projects has a social cause/ theme we are shining light on, and we invite you to dive in and join the Zeropoint 528 movement. After 10 years in the animation industry as a content creator, with a background in human behaviour and potential, I am also currently writing a book; "Story meets authentic Self" and I will be creating transformational mini online courses from each chapter to offer to our community and heart-centered platform. Creating a conscious creation vortex where imagineers, creators and writers can gather, learn, share, grow and collaborate, guided by a more feminine, heart-centered and unifying vision with a deep love for storytelling and the desire to make a universal impact. The goal is to grow this community with your input and support, offering podcasts, meetups, workshop retreats, collaborations and more down the line. The creation and development of ideas and impactful universal concepts mission takes much resource and time, and a bigger team to pull it off to gain traction. We have a clear vision, creativity, talented artists on board and inspirational ideas. Having sustained the ride for many years alone, I know there is no more lone wolfing allowed! We are all in this shift together. And it is time to grow, spread our wings and fly. It's time to collaborate, share the road and get these ideas out of our heads, off the page and onto screens...This is where you are invited to jump in the vortex with us and amp up the frequency in the miracle zone. A short animated film and a VR (Virtual Reality ) film experience and global campaign. Like a phoenix, the feminine must rise and embody the heroine of her own legend. In support of freedom of choice to shine your light, not forced into child marriage, opening the door for girls’ education, health, and freedom from violence. “Traditions are made by people – we can change them.“ ~ Graça Machel, widow of Nelson Mandela. 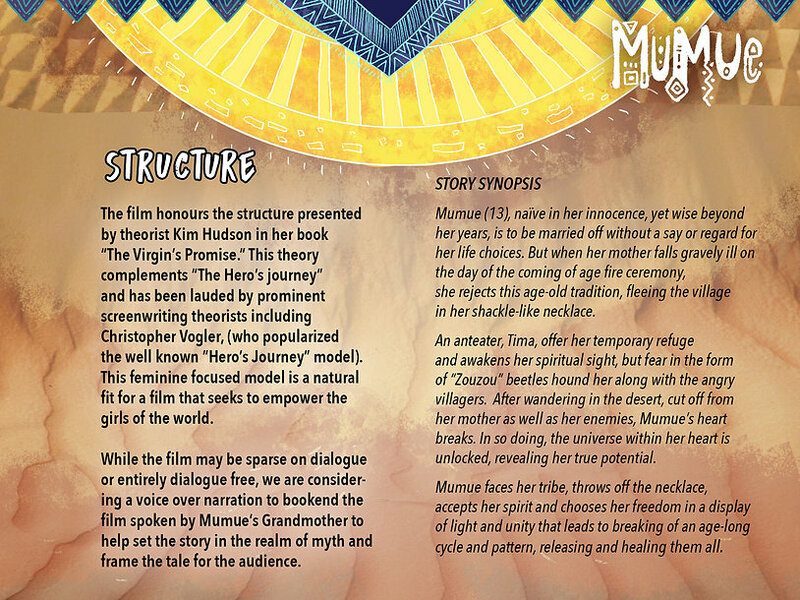 “Mumue” is an animated myth for the future; a coming of age story about a young girl from an ancient lost tribe who unknowingly carries the secrets of the universe in her heart. Mumue’s tribe appear bound to patriarchal and fear-based beliefs, by mere patterns of tradition and habit. Mumue’s unique gift of extreme energetic sensitivity, once realized, together with her eventual connection to a strong sense of self, ultimately bring change and empowerment to both her, and her people. Mumue is able to connect with unseen realms through nature itself. She needs the courage to risk being seen for whom she really is in order to free herself from her tribe’s custom of pre-determined child-marriage. But Mumue must overcome her fear of being rejected by the very community she is rebelling against. By choosing the path of her soul, she discovers her true nature and remembers that she holds inside of her the “Munina.” She is the “bringer of the light” they all have been waiting for. Research trip footage... The World of Mumue. Experience a dreamlike encounter with Mumue on her inward awakening journey as she rejects an age-old tradition and runs away from her tribe to seek clarity. It starts with a remembering, a waking up out of fear to potential, natural gifts, inner strength and power. The awareness campaign is developed around an animated short film with universal themes, produced at high production value for the festival circuit. The intention is to create an artistic, dreamlike, short VR film experience to send to festivals offering VR in tandem to the 2d film campaign. We aim to drive awareness globally amongst girls and communities. 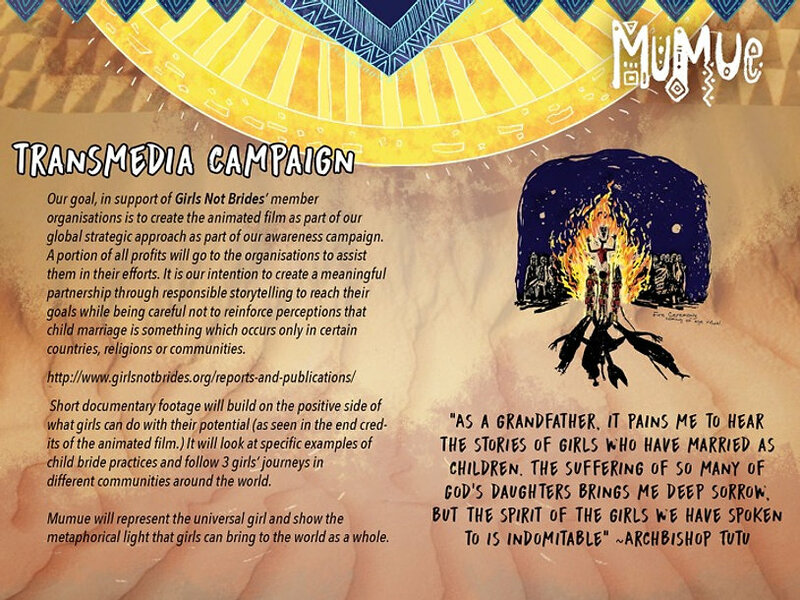 The intention is to connect this topical issue to a global audience through an empathetic emotional experience: what it feels like to be inside the very human experience Mumue goes through on her journey to freedom and self-realization. Ultimately we seek to encourage further support for girls and be an aid to agencies and organizations with their efforts to end child marriage. Using an empowerment approach can lead to positive outcomes for girls and their families by supporting girls to become agents of change, ultimately helping them to forge their own pathway in life. I am Chuma tells the story of a young, black, lesbian woman who found herself homeless and living rough on a park bench in Cape Town for 3 years. Chuma unexpectedly finds her calling as an artist when to survive, she responds to an inner voice and embarks on an empowering journey, but meets new societal challenges in her yearning to be truly seen. Experience empathy and agency through the life and eyes of a young, black lesbian woman, who is homeless one winter. A physically disabled Chuma unexpectedly finds her true calling as an artist when, to survive her fears of attack, she chooses not to be mixed up in a vicious circle of violence, drugs, prostitution, and theft but instead, goes within, finds inspiration and begins to draw relentlessly. 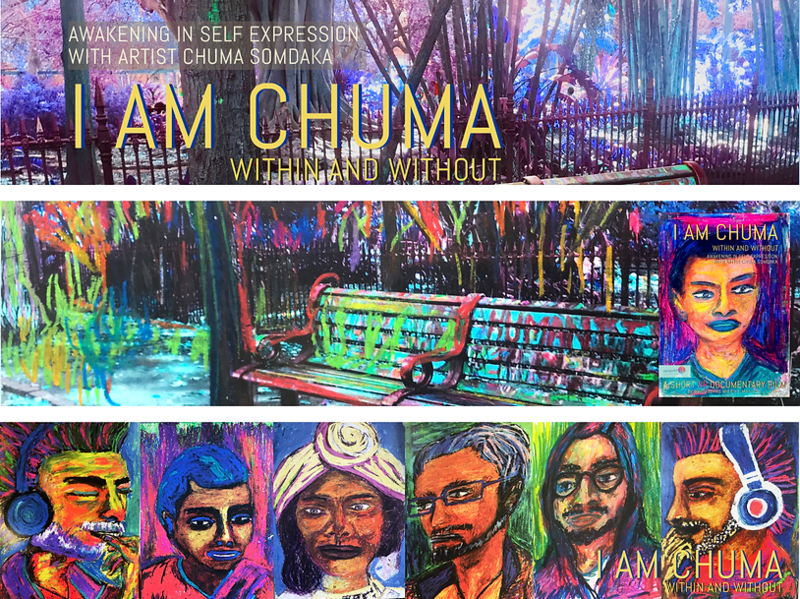 As Chuma makes empowered choices, she experiences an enlightened awakening of her authentic self-expression, through the conquering of her fears in her darkest moments, while living on a bench in a city park. I will share our wins and fails as we progress and also share our journey as we experiment with different funding models, strategies, tech solutions and software as we endeavor to raise funds to get these cutting-edge creative projects made. For each tier, I commit to sharing and sending you updates and created materials as we progress and honoring the promises made. The rhetoric of the past saw much embodiment of victimhood consciousness and fear. Patriarchal structures, within our society, leave a self-perpetuating legacy of the disempowered feminine. It is time to release this pattern. Separation beliefs divide a people, divide masculine and feminine energies and gender. The vision is to create a community and platform for storytellers to share their feminine energy healing journey stories (all genders included) and experiences with a wide audience with the intention to balance and harmonize the collective. Ultimately I commit to doing everything in our power to get these projects funded and realized spread awareness, shift perspectives and amp up the frequency in our shared world. Your support will keep the Zeropoint 528 journey moving forward, and us too of course! By joining this movement you support sustaining Zeropoint 528's progress as I dive into planning and raising the bigger funds for animation and VR productions, you will also be helping us grow our platform, create new concepts and get an ebook out as well as mini online courses for our intended community. Animation is super expensive, so it is unrealistic to expect your hugely appreciated support of the projects and platform to be the sole funder.. BUT you will be the catalyst, the force that builds, allows, unlocks and opens into the next gateway or funding portal such as film/ VR funds, publishers, crowdsourcing campaigns etc. These take planning, time and much resource to pull off. With your support we can work towards creating a tipping point, building an audience and platform that hits that miracle tone...Allowing us to really amp up the frequency and be the change. Thank you for your love, we receive it! Recent posts by Zeropoint 528.